It is estimated that a website has about 10 seconds to grab the attention of a user before they go in search of something that looks better, loads faster and is more relevant to their requirements. Various studies have shown that almost one third of consumers leave a slow site within less than 5 seconds, while a page load time delay of 1 second can result in page views declining by 11%. With this in mind, it is clear that anything that takes away from the user experience could damage user engagement and ultimately conversions. Responsive web design is all about creating a website that works across all platforms and media, and is something we specialise in here at Brighter Media. Via a combination of flexible website layout and intelligent CSS media queries we can create a site that provides a seamless user experience regardless of whether they are using a laptop, smart phone or tablet device. If you’ve ever been trying to use a website on a mobile device but found yourself having to play around with the screen size or that it simply doesn’t display correctly – that’s because they weren’t implementing responsive web design. 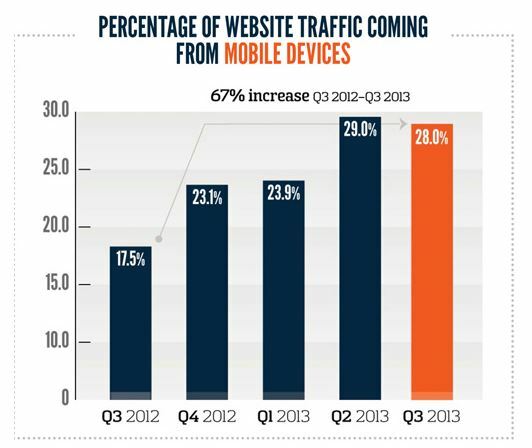 So is having a website designed using responsive web design practices really that important? We think that in 2014 it is absolutely essential. In the final quarter of 2013 over one quarter (28%) of internet traffic was via mobile devices – that’s a 37.5% increase on the same period in 2012 – and that figure is only likely to grow as more and more of us adopt smart phones and tablets. Therefore, if your website is not providing an optimum user experience simply because it is not displaying correctly on these platforms then you could be losing an increasing number of leads as the year progresses. If your website doesn’t make use of responsive design then try to navigate around it yourself via a mobile device to see how easy it is, or you could ask family or friends who aren’t familiar with it to give it a go so you can get some feedback on how your site performs on smart phones and tablets. If you have any questions regarding responsive web design, or any of the services we offer here at Brighter Media, contact us today to request a call back.